That makes sense I left space on the plywood sheet to add an extra inch or two around the sides and back. I will cut it that way to be safe and then trim/plane down as necessary to get the proper shape afterward. Made it about halfway through cutting out the 3/4 inch ply pieces no pictures yet as it's still just a big pile of wood. Should get the rest of the pieces cut out tomorrow. Well it's been a while since my last post, I've been slowly making some progress I started sanding the frames down and am getting ready to assemble my first frame. Things have slowed considerably in order to get our bathroom remodeled, it needed to be fully gutted and the contractors have been here over the past week or so putting things back together. Unfortunately during the demo I managed to put a good cut in my elbow and a handful of stitches later I've been completely out of the game over the past week. I did manage to get myself a hand plane for restoration/use of Ebay, it's a Stanley Bailey #5 late 40's model. While I wait for the elbow to heal and the chaos around the house to settle down I've been cleaning up the rust and will be getting a set of sharpening stones this week to hopefully get the plane tuned up and ready to go. PS.. The Skeletool from Leatherman is a great multitool even if only for opening bottles of beer! So sorry to hear about your elbow, but nice plane! a couple hours of tlc and that plane will still be around for your great grand kids. paul sellers did a great video of restoring a plane that's worth a watch. So it's been quite a bit of time since my last update here. Work has stopped on the boat but for good reason, my wife and I found out we have our first child on the way. Things have been on hold while I work on prep around the house and I simply haven't had time to really make any progress. I do miss the forum and community here (even if I was mostly a lurker) as I haven't been around as much. I know everyone says things won't settle down but as the house prep slows down I hope to at least make it back for some reading and to be able to continue the work even if at a slower pace. We understand here! Try to sneak 15-20 minutes a day for the boat. You'll get there! It took me nearly 5 years to build my Glen L 14. Make a list, knock off small jobs here and there. Never watch TV, and uninstall Facebook from your phone. You'll find the time. Hey! I built a boat ! No Really, I did ! 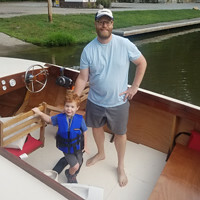 A majority of the work that I have done on my boat was after the birth of our first child. Of course I'm not done yet by a long shot but the finish line is in sight. Your work doesn't look like After Birth to me. Thanks, Bill, that's a great compliment! Wow sorry guys, I missed a couple of replies here. I haven't made any real progress on the boat unless you consider finishing up everything for the baby room and getting the house ready as boat progress. Our baby is due any day now and with that I'm looking forward to the new challenges that accompany a child, but I've also got the house in order so when I do have free time I'm looking forward to getting back into it. I do have a scale to measure out epoxy on the way as the next step for me is to start putting together some frames! Getting back on the forum has been good for getting the motivation back, I've also been reminded through some friends that it's been a year, I can't believe how fast time flies. After what's felt like a whirlwind of a year we had a baby boy on Oct 26th. With the new addition to the family I had some time off and finally got myself caught up around the house between time spent figuring out the little guy, he's our first so there's been quite the learning curve there. No pictures but I did manage to laminate my stem this weekend, a small job but it felt good to see something start moving forward. I had been struggling with stripping the bronze screws when trying to screw into the white oak and finally found some normal threaded #8 steel screws to thread the holes before fitting the bronze fasteners. Seemed like every screw I found at Lowe's was coarse threaded and wouldn't work for my purposes. As I've been reading through the instructions and various threads as I catch up on the forum I do have a question. I'm getting a shopping list together to work on the centerboard trunk and the build notes mention fiberglassing the interior of the trunk. Originally I had not thought about doing this, I was only going to coat with epoxy. Epoxy is not UV stabilized and as I understand that can cause some yellowing and degradation. On an area such as the interior of the centerboard trunk should I apply some kind of protective layer over the epoxy, even those UV exposure should be minimal? Congratulations on the birth of your son. The world needs more sailors! I am unsure about the phrase "stripping the bronze screws" and I'm probably writing things you already know. I've never flattened the treads of a bronze screw going into wood like you might with metal screws going it metal if that's what you mean. I "bugger" up the heads as the bit comes out of the slot. I use square drive screws and find I bugger up fewer heads. I also twist off the heads sometimes. When it is oak v. bronze screws, the oak wins every time so a properly prepared hole is critical. There are a few tricks getting bronze screws into the wood: the hole has to be deep enough that the screw doesn't bottom in the hole as the bronze is to soft to be forced between the wood fibers; the top of the hole must be large enough to accommodate the shank of the screw (the oak will not yield to even a slightly over-sized screw); bronze screws are tapered, invest in tapered bits; a little wax or soap on the treads helps to lubricate the hole as the screw is driven (Some carry a bit of bar soap or candle for the job. A toilet ring works but is a little messy when little fingers are around ); if using a drill driver, turn down the torque and finish the last turn or two by hand; and, consider going up a size on the screws called for, i.e., use a #10 when a #8 is called for. 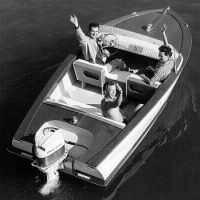 I would glass the inside of the trunk if called for in the plans and do what I could to coat the inside of the trunk while coating the hull. As Tom said, invest in some tapered contersink bits. I always drive a fine thread drywall screw down the hole first. I have a toilet wax ring that I stick a bunch of screws into so they are ready to go. Set your torque low on your drill, apply plenty of pressure on the screw and don't drive too fast. I picked up a screw extractor at home depot to remove and replace stripped screws if need be. Even after all of this I still strip the heads of screws out on occasion.